There’s something wonderful about taking time off; going away from your daily routine for a few days and just regrouping with your mind, body & soul. Every time I get such chances to do so, I get this weird excitement with in my soul. Its the joy of knowing that I am spending a whole weekend away from the noise and distractions. The feeling of utter release with the anticipation of a little adventure and freedom from daily routines. Yes, I love getting away. A had a chance to spend a whole three days at the Speke Resort Munyonyo for a weekend with a few friends; days of lazy, delicious food, a lot of laughs in between glasses of wine. That Friday had been long for me, but I checked in with a lot of ease and I was chauffeured to my room via golf cart. In all honesty, I could have walked but it seems they could see the fatigue on my face so the duty manager just recommended I get ferried around (this made me feel so special, thought its reserved for VIPs only). 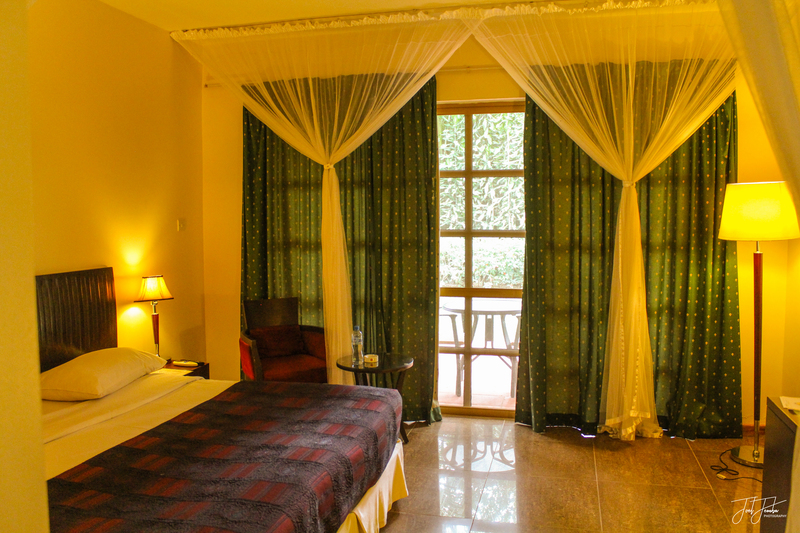 My room was beautiful, it was close to the lake but surrounded with huge palm trees and thick climbing shrubs that harbored nests for different species of birds which chirped away as the concierge offered to open my curtains. The huge balcony was facing into beautiful shrubbery covered with climbing flowers hanging off pretty leafy tendrils and just a steps away was the grass, which felt so “carpety” to my feet. Rooms at the Speke Resort range from $145 to $600 a night and all guests are entitled to free usage of all hotel facilities including the pools, gym, steam & sauna as well as the tennis and squash courts for the length of your stay at the hotel. 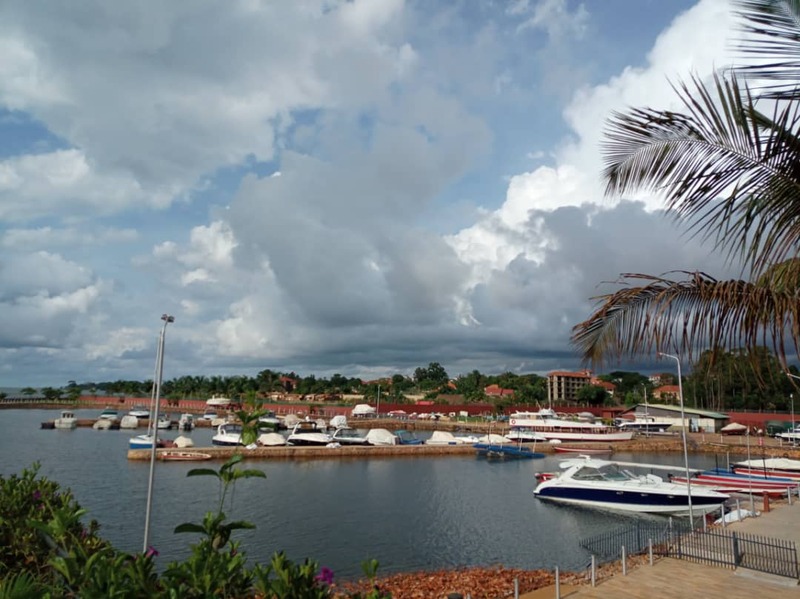 To my right, were several other rooms and a view I had been dying for but forgot to ask for when booking; beautiful yachts, canoes, speed boats and fishing boats docked on a spacious marina at the shores of lake Victoria. I was so excited about the lake that I forgot that my room wasn’t locked and stayed there mesmerized by how the sunset rays reflected onto the boats as the king fishers dove into the water in a distance for a final catch. Fishermen in the horizon were setting their nets for the early morning loot and a few young people were walking on the marina, some in couples just laughing while in the distance event setup crews were working on tents and chairs for the wedding festivities coming up the next day. Everything was just beautiful that evening, I mean everything. 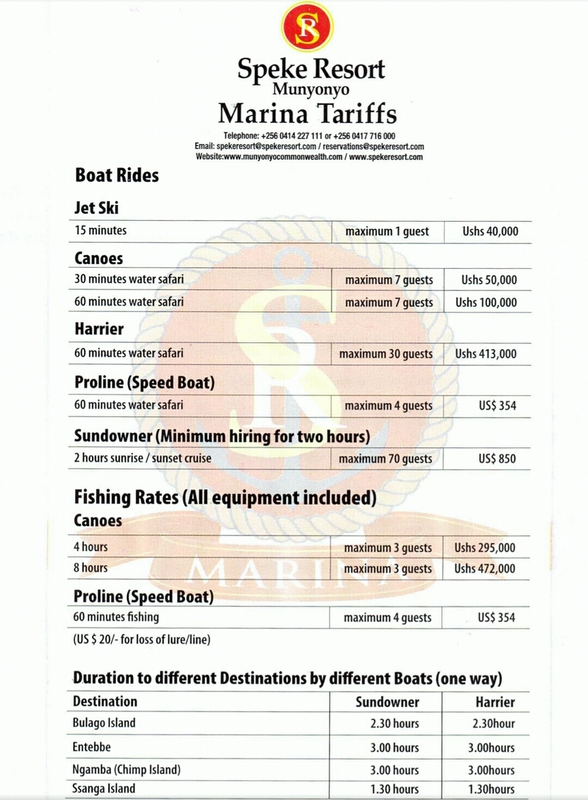 The marina was set up in the year 2000; you can part with a meager USD 30 per day just to have your boat safely docked at the Speke Resort Marina and if you do not own a boat, there are jet skis, canoes, fishing boats as well as my favorite, The Sundowner for a hire (see price list below) and have fun frolicking or touring the lake. If you want to fish, you have to do so every early in the morning before the birds wake up so as to get the good juicy tilapia or nile perch. The marina is quite huge, there were over ten boats of different sizes docked side by side; as it gets dark you can notice that one of them is a security boat that is docked a little far off. If you look closely you can notice the hidden cameras in security lights when moving around the marina When I walked back into my room, it was dark outside and my body was cold; turns out short shorts were not made for the cooler weather. The hotel has two pools so my mind was telling me to go for a swim to the one near my room or go for sauna at the ever busy health club but my body wanted a nice calm soak in the tub. My feet were not happy either so I drew a warm bath, picked my book and calmed my bones while finishing the remaining chapters of the book. The bathtub in my room was huge but if you are beyond 5’8, you might just need to sit instead of laying in the tub. 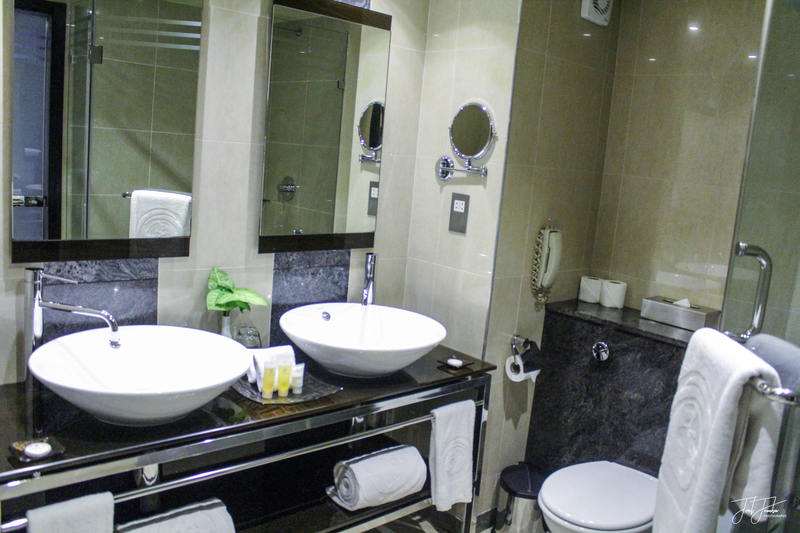 There was something about how spacious the bathroom is and well lit it was designed. I love mirrors and the big wide one by the sink made me gawk at myself after walking out of that body healing bath (they provide you with these aromatic bath soaps in the bathroom that will leave you relaxed and smelling so nice). Thoughts of what to wear for dinner ran through my mind but I instead went straight to bed after drying off. The main reason I was at the Speke Resort Munyonyo was to get a hold of my fear for sitting on animals and take a nice long sunset ride on the aptly named, Sundowner. The second day was just for that and after a hefty breakfast at the Nyanja restaurant we headed to the stables were I met my friend for the day. I was a little late for the ride so everyone went ahead without me but we caught up after since Zulu was in good spirits. We trotted near my room and unto the marina then went back to the stables where we took pictures of the horses and laughed about everything, there was this air of joy around us growing stronger with every relaxing day. The Speke Resort is like another world of its own, there is space for almost every event to happen simultaneously on the property; you can have weddings or conferences in the several multiple seater and well planned conference halls, a festival at the beach or a small pool party at either of the pools depending what you fancy. At 4pm, we took the expected “before the boat selfies” as we boarded the Sundowner, picked seats appropriate for banter near the bar without even noticing it then went ahead to leave them so as to tour the huge boat and of course take pictures of our surroundings. The sun didn’t come out that evening but something about being on the water calmed my spirits and filling my heart with happiness as I marveled at how freeing it is to be on the water. There were birds flying over head, some swooping in and beautiful islands floating by on the lake looking so serene in the distance. The water was a little restless but our Captain fared through while a small rescue boat moving, though a little distance behind us in case there was an emergency. 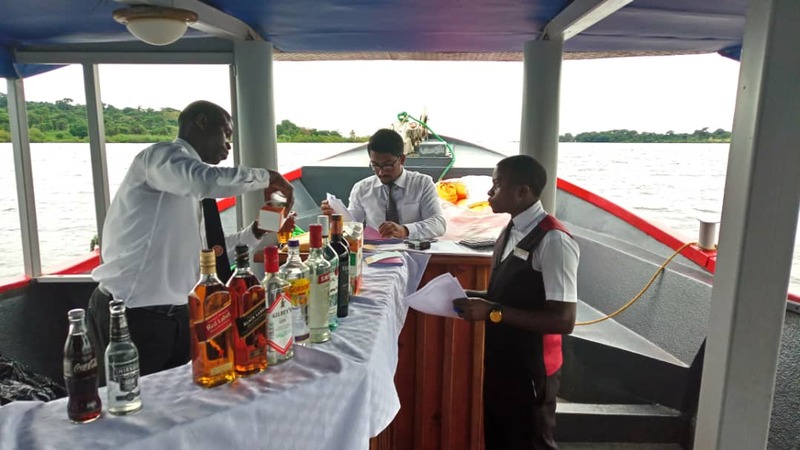 The Sundowner is a 70- seater which is well stocked with wines, soft drinks, liquors and even champagne of which you can pay for on order or credit your room to pay when checking out. 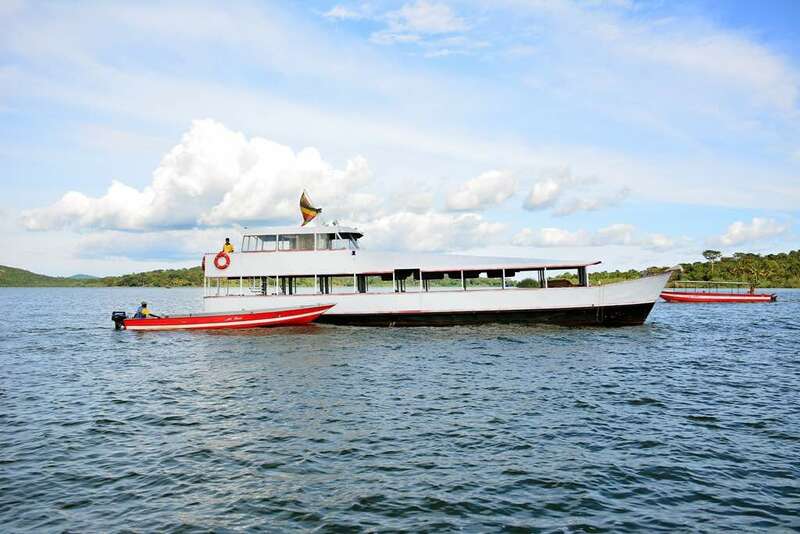 Food can be ordered before the boat ride for snacking so as its prepared earlier but since the ride is not too long, you do not have to eat unless you have booked the boat for a few hours then you might need something to snack on. We got back to the hotel hour later but it seemed like a 30 minutes ride on the lake then went for dinner afterwards. 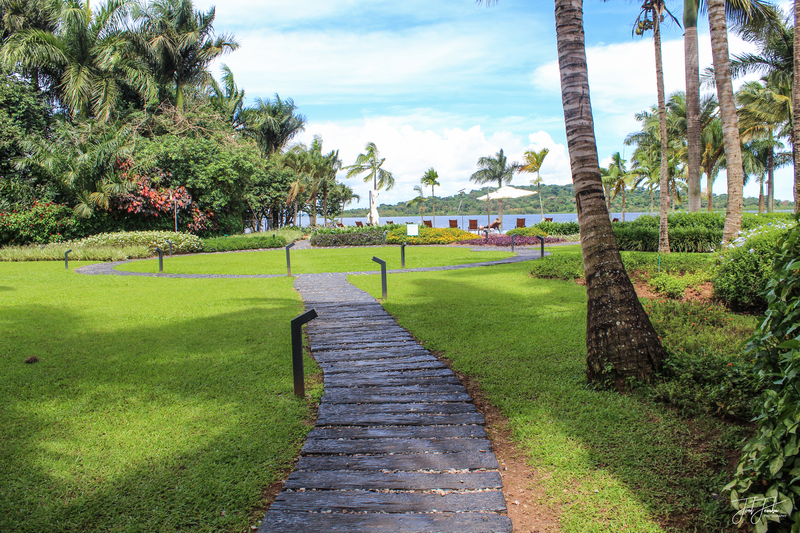 My weekend at the Speke Resort was quite a wonderful one, I feel the need to save up for the another one, so glad they have many nice affordable rates which you can check for if you ever want to visit. Or you could go for a Sunday stroll at the beach while a live band plays with a kids play area if you choose not to stay there. 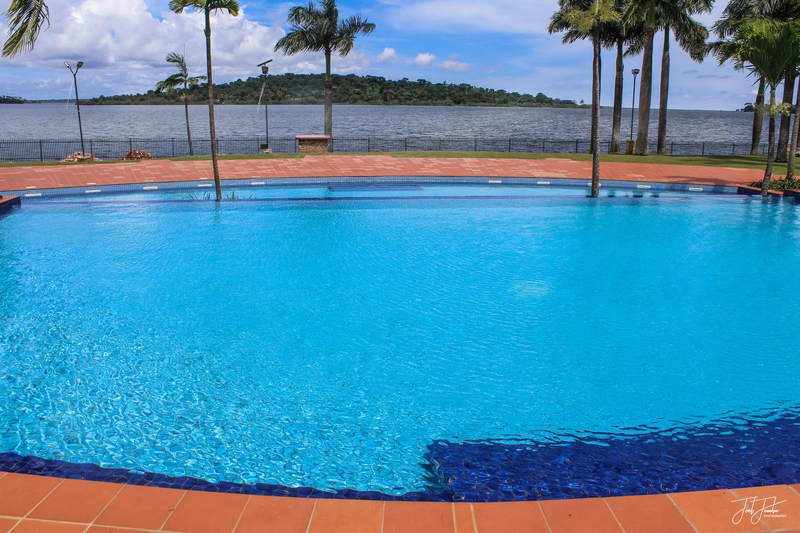 For bookings, you can check this link and have yourself a relaxing day at the Speke Resort Munyonyo as well. Note: Did you know that there can be over 4 weddings happening at the Speke Resort in a day? Wow, Evelyn what a packed weekend that was! 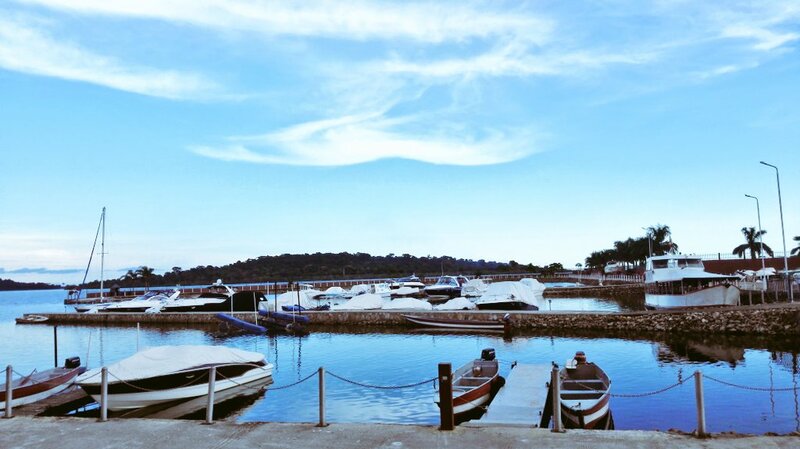 Few people know there’s so much to do just on our doorstep… great blog!